Last winter, Fringe ended after a five season run on Fox. Focusing on Olivia Dunham, an FBI agent teamed with Walter Bishop, a formerly institutionalized scientist and his son, Peter, Fringe quickly evolved to become one of the densest and mythologically richest series in the history of television. Within the show, there were the Observers, evolved humans from the future who exist out of time who have their own agenda. One, September, became an ally to Olivia and the Bishops and his notebook documented his observations of our world. But the introduction of “September’s Notebook” didn’t start with the show, but rather two writers, Tara Bennett and Paul Terry, who pitched the book as a series companion and then found it being incorporated within the series. The book itself is gorgeous. Packed with ephemera, it serves not only as a complement to the series, but also as it’s own unique and special love letter to the fans who embraced it. Tara and Paul were both generous enough to take time out of their busy schedules to chat with Forces of Geek about the book, the series and the process. You both have worked with Bad Robot and co-authored The Lost Encyclopedia. Did you pitch this originally or were you approached to do a companion to Fringe? Tara: Well, we’ve worked with Bad Robot for the better part of a decade now on a variety of projects so we’ve gratefully established a really wonderful creative synergy with them. For the Lost Encyclopedia, Paul was asked by ABC and Bad Robot to author the book and then he requested that I co-author with him because we have a creative shorthand with one another. For the September’s Notebook, I pitched the book to Fringe’s EP’s, Jeff Pinkner and Joel Wyman, and they said yes to the project. A bit later after some creative discussions with WB and Insight formally taking on the publishing, I initially brought Paul onboard as a creative consultant, but he more than earned his co-author/creator title as we got deeper into the concept and execution of the book. Paul: …And I can’t thank Tara enough. This is definitely the most creatively rewarding project I’ve had the honour of being involved with. It was 2003 when we first worked together for the Alias magazine, and I’m so thrilled, and still can’t believe that ten years on, we got to craft this Fringe book. How did this evolve into September’s Notebook? How early on was it decided to be written within the universe as opposed to a more conventional series companion? Tara: Once we got the yes from the EP’s and we found out that Bad Robot producer Noreen O’Toole would be the transmedia lead on the project (we collaborated with her extensively with the Alias and Lost Magazines and Lost Encyclopedia and she is the absolute best at what she does), Paul and I then literally sat down in my home office when he was visiting and came up with three different approaches to the book. Soon after we had a big conference call with WB, Jeff, Joel and Bad Robot to pitch our ideas and they chose our idea of doing a notebook written in September’s perspective. Paul: I remember from Tara and I’s first conversations, we definitely wanted the book to be in-universe, if that was a possibility. The Fringe world is just so rich and multilayered, that to craft a book that honored that in some way – working as a shade, echo, or reflection of it – was always in our sights. 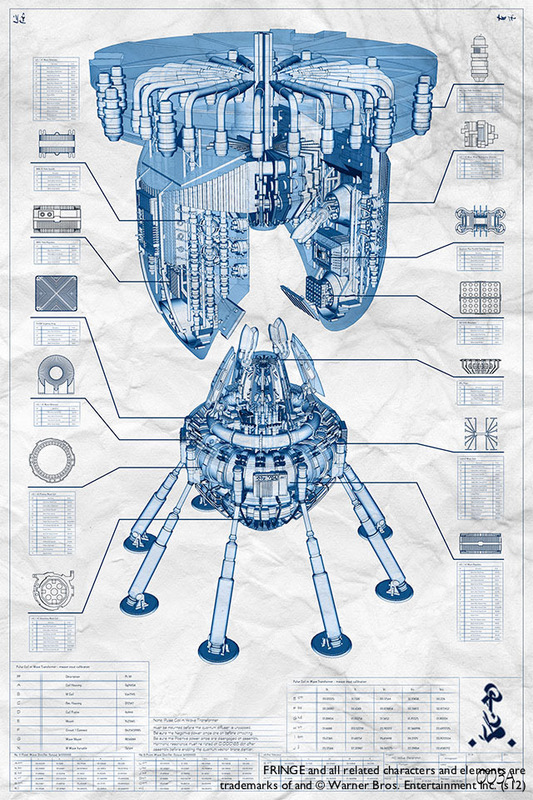 It means that the creative gears can get slammed into overdrive, and the project becomes more important: to us as the makers of it, but most importantly, to the fans and the show. A book that looks, feels, and reads like it’s part of a TV show or film’s world or mythology will always excite fans more than a conventional “making of” of behind-the-scenes guide. A project of this magnitude requires an infinite amount of research. Did both of you enter this project as a fan of the series? Tara: I was a huge fan of the show. I will admit it was a slow starter with me in season one, but I knew there was something there that really intrigued me about the characters. By the end of season one, I was all in. As to my passion for the show after the intense amount of work Paul and I did for the Lost Encyclopedia, we both had to take a break and do other creative things to decompress. But during that time, I asked myself what other series do I love enough to want to make it my next project. 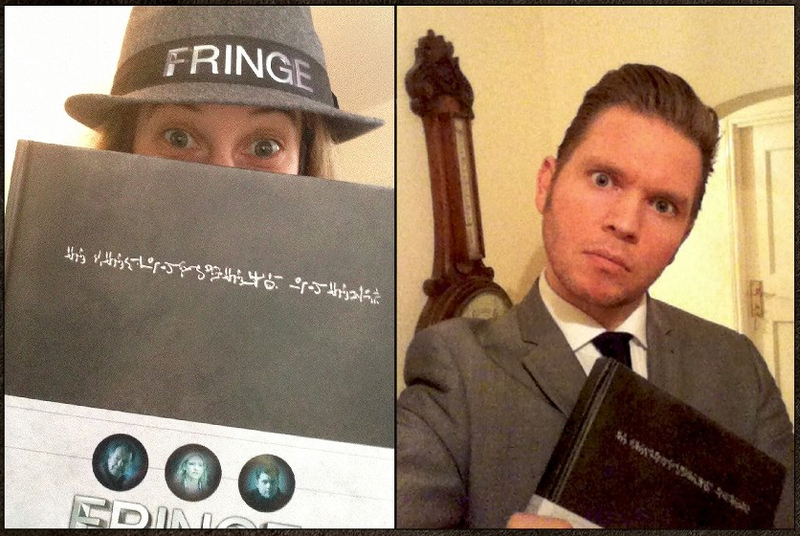 Fringe was the clear answer and it’s why I sent the Lost book to Jeff and Joel with a little note just putting it out there that I thought their show deserved something special too and if they ever wanted to do a book, I’d love to talk with them about it. Paul: Thank the multiverse that you did! During my time as Editor on Alias and Lost Magazine, I had barely any time to watch the occasional film, let alone dedicate time to watching other shows. It was an amazing time, but what happened when Lost and its magazine concluded was that I finally had time to catch up on so many shows I’d been desperate to watch: including dear Fringe. And as Locke would put it, “everything happens for a reason”… just as I was getting caught up with the fourth season’s first episodes, Tara called about the book. You started working on the book with the fourth season. Were you able to actually watch the show as a viewer or were you immediately analyzing it for inclusion into the book? Tara: We’ve been covering film and television separately for more than a decade so it’s an occupational hazard for us that some shows shift from just fan enjoyment to behind the curtain access and insight. We’re really lucky to have that opportunity ever, so we never see it as giving something up. We are humbled and honored that showrunners and studios trust us enough to know than the average viewer does ahead of time so we can build alongside them the best finished product we can. So we read scripts and watched episodes with a different perspective but it was in no way a lesser process, even when that meant our gerbil wheel brains were always looking for things to add to the book. Paul: Absolutely. Some of the most exciting ideas came from our conversations after reading the latest script. And then came the constant challenge and awareness that we knew we had a locked page count. But that is what keeps you creative. The various ephemera included in the book. Were these your decisions in terms of what was included and how closely did you work with the show as well as book designers on the finished project? Tara: We worked with the show and Bad Robot every day for a year consulting, tweaking, discussing and in the final months, furiously making content changes based on their writing room changes for the last episodes. September’s Notebook was also our conceptual baby from the start. It’s the dream book we’d been hoping to make for some time and it was great to work with Insight, a company whose forte is creating books with a very visceral and outside the box approach. We worked with several of their designers explaining our aesthetic and reviewed every page layout, picture choice and even got very Type A about the paper stock used and the faux paperclips on the pages. To their credit, Insight got our vision and brought it to life in a really beautiful book. Paul: It was a dream situation for Tara and I to be given an 85gig hard drive from Fringe’s production team, bursting with tens of thousands of images, sketches, photos, props, etc… this was the absolute Aladdin’s cave of Fringe nerdness and treasures. Our publisher Insight was great in allowing Tara and I to go through every single one of those images and options, and select the things that we felt helped sell the concept that this notebook had been hand-crafted by September himself. Can you describe the process of a project like this? How much is rewatching episodes, reading scripts and making notes? And then how do you distill that information into the text? What didn’t make it into the book that you wanted to include? Tara: For me the hardest part was always remembering I had to distill all of the show information into September’s perspective and voice on the page. We didn’t want to do a boring rehash of everything in the show, so using his unique distillation of the mythology and characters made it a completely different writing experience for me. It made me nervous and also forced me to think like a character for the first time, so I focused on pulling out important moments for the blue notes and his summaries that hopefully captured the essence of the show. As for what didn’t make it, we could have done a 400 page book just with all of the images and material provided by the Fringe production team. I think having a locked page count made us more selective and focused though, and ultimately made it a better book. And because the book was canon and only from September’s perspective, there was a lot we didn’t cover in season five because he didn’t participate in the Bishop’s adventures, so I miss seeing that just a little bit. Paul: The process as a whole is pretty gargantuan. As with any book or magazine, it always starts with a flatplan, or page plan / grid. Once the concept of this being September’s Notebook was finalized, we started with that – working out exactly how we would tell the story across 192 pages. When I returned from the first US trip, we really dug into that process. We then rewatched every episode, and made thousands of words of notes and – ‘scuse the pun – observations on the characters, stories, and everything about the show. Through daily Skype chats, emails, texts, Tara and I slowly saw the angle for the book take shape, and a clear path began to emerge about how to tackle what did feel like a mountain of a task – mainly because of the responsibility to do the show justice. And of course, we started work on the book before season five was even picked up, so we had to do some very strategic page planning there – to make sure we had a battle plan that would work either way. Tara: It’s super hard to pick just one! I’ll say the finale because it did tie together the show for me thematically, creatively and emotionally. I loved Peter, Olivia, Walter and Astrid’s last goodbyes. They broke my heart, each and every one, in the best way. Paul: Out of 100 – that is too hard! The finale was incredible. I’ll pick ‘Olivia’ this time round, as Anna Torv really knocked it out of orbit in that one. What are your upcoming projects? Is there any show currently on the air that you feel has a mythology rich enough to support a book like this? Tara: My next book, The Art of Epic, which tells the creative journey of Blue Sky Studio’s (Ice Age, Rio) upcoming computer animated film comes out from Titan Books on April 23rd. Otherwise, I’m always doing my normal entertainment and nerd journalism for print at SFX Magazine, Total Film and Sci Fi Magazine. Online, I contribute to Movies.com/Fandango, TV Geek Army and FEARnet. And Paul and I hope to do another geek-centric book project soon – we have some irons in the fire but you never know in this business. Tara: Just finished BioShock: Infinite, which I highly recommend to Fringe fans. There is a lot of thematic synergy between the two. I adored it. I have the new David Bowie album and that’s bliss to even say! On TV, I’m enjoying Hannibal, Game of Thrones, Parks and Rec and Happy Endings the most right now. Paul: Oh man yes, BioShock: Infinite was so amazing! I’ve gone a bit Bio-bonkers and recently acquired the Songbird statue too. Clint Mansell’s Stoker score is doing it for me right now – definitely one of his best. Just rewatched Pushing Daisies which I adore (please come back! ), and Game of Thrones is doing it for me too. I’m a longtime Fiona Staples fan, and her Saga work continues to amaze me. And anyone into art in any form should investigate what the 44FLOOD team are doing – their TOME book is a astounding. You both actually provided the epilogue to the entire series with September’s Notebook. How’s it feel to have the last official word of the Fringe Universe. Tara: Well the end of the book is truly Joel Wyman’s creation, but we are just so humbled and honored that our book was the conduit of that message of hope which is what Fringe is all about. It is truly the book we are most proud of making and that it is deeply embedded in the Fringe mythology is a dream we couldn’t have ever hoped for so we’re still actively pinching ourselves. FRINGE Season Finale Trailer Arrives!